Fantastic addition to B-Sides. 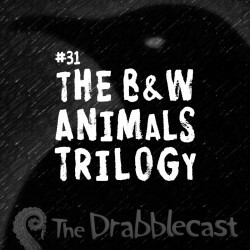 This trilogy was one of the benchmarks that convinced me the Drabblecast was a thing totally unlike anything else in the world. Imagine if Stephen King had written Winnie the Pooh, performed by Firesign Theater. Before there were Seal Team 6, there was Velasquez, first recipient of the Drabblecast Medal of Honor. Yes, folks, this trilogy will one day be analyzed and parsed by academics in pursuit of PhD's in DC Studies. Why not be one of the first in the field? I forgot how great these stories were, I need to go back and listen to some of the older stuff again. Ah, I loved that one! I had forgotten that the name Connor Choasdworth first made it's appearance here. I'm glad Norm re-used it for something more. "Put the boulda down, Harry." It was great hearing this again. I remember it vaguely from the episode archives but hearing it unabridged and in full again really made a difference. It's the kind of story you drive around the block an extra few times for because you aren't quite finished listening to it. It's so absurd and hilarious, and in the end treated so seriously. Bsides has been totally worth it since signing up because of gems like this mixed with great original stuff. This trilogy was all kinds of awesome. I don't remember ever having heard it before -- it must have been before I got hooked on the Drabblecast. It was great hearing "Young Norm" and realizing how much energy the team has put into production values over the years. Great reading and accents too and a fantastically weird story to boot.